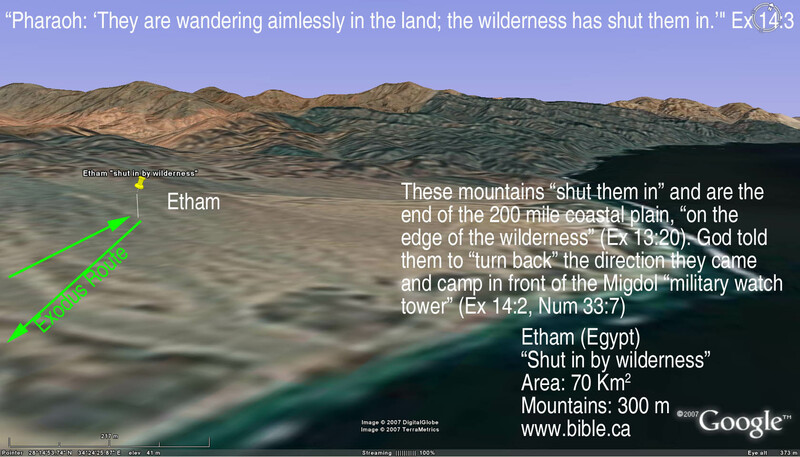 The Exodus Route: Etham "Shut in by wilderness"
Hb. šûr = “wall” and Egyptian htm = “wall, fortress”. 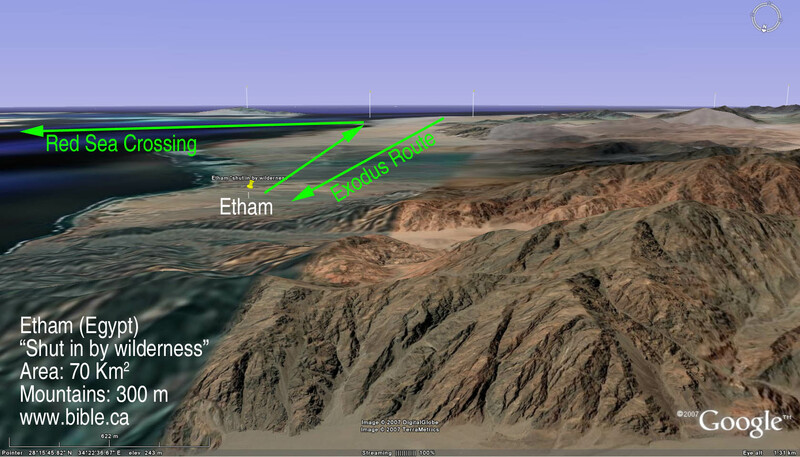 Etham is one of the most interesting and most important locations for determining the exodus route and the crossing of the Red Sea. Etham, where they camped has an area of 70 sq. km. 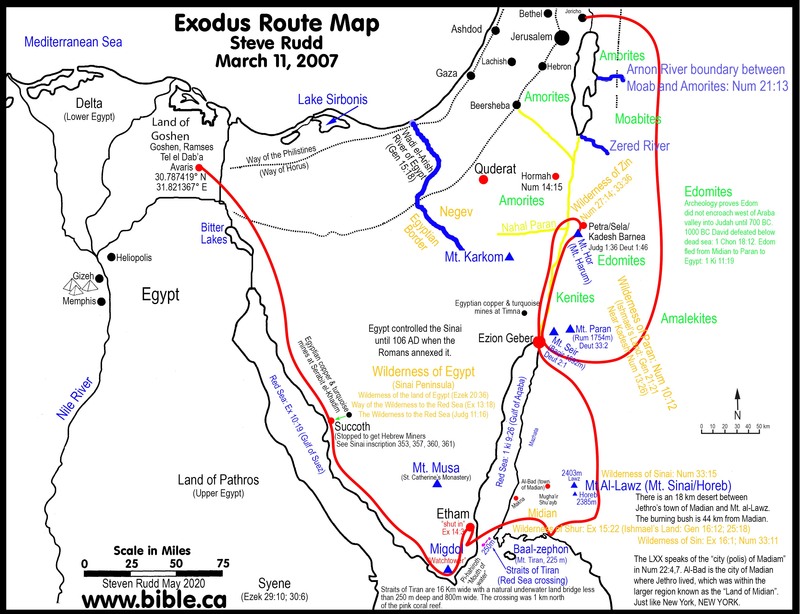 The location of Etham requires the exodus route to take Israel past the Migdol (military watchtower), come to a dead end because the "wilderness of shut them in", then turn back and retrace their steps and camp beside the sea under the nose of the Egyptians watching in the Migdol. This key point is what disqualifies all other Red Sea crossing points except for the Straits of Tiran. No other proposed crossing point works. 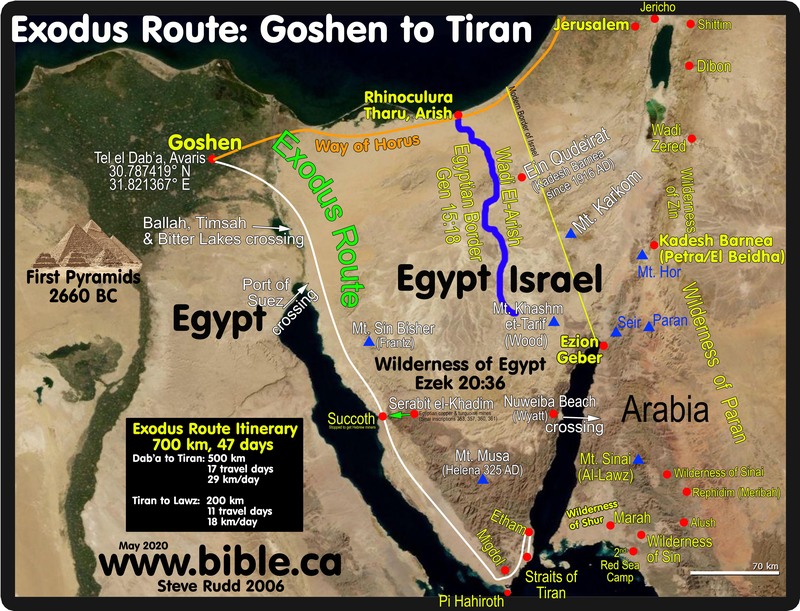 The Straits of Tiran fit perfectly... because it is really where Israel crossed! 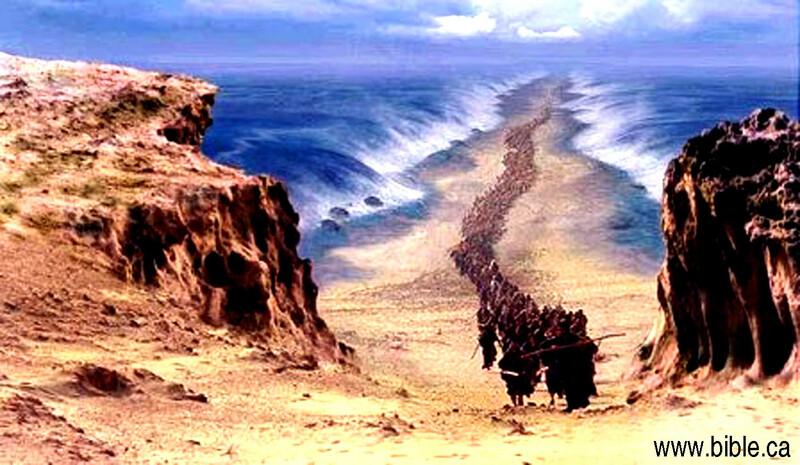 After crossing the Red Sea, they went three days into is the wilderness of Shur. Therefore, the Wilderness of Etham is identical to the Wilderness of Shur. c. Perhaps the Straits of Tiran were viewed as a "wall" from both sides. On either side there was no place to go but back or cross to the other side. It was a dead end on both sides! The "Wilderness of Etham" may not exist. It is not in original text of the Bible in the Septuagint. It is only found in one passage: Num 33:8. Etham is not in the LXX at Num 33:8. Instead, the Septuagint has the word, "they" which is spelled almost the same, with the vowels removed. This is a gloss that has crept into out Bibles. It may be a textual gloss: Etham is not found in the LXX in Number 33:8. The Hebrew has no vowels and "Etham" is almost identical to "them". Perhaps the Masoretes erred when they added the vowelling. Many commentators completely ignore it in Num 33:8.
e. It may simply mean there is a place called Etham on both sides of the Gulf of Aqaba at the straits of Tiran. Which if these two are correct is not that important. It simply means that there was a place called Etham before they crossed the Red Sea and a second place called the "Wilderness of Etham" after they crossed. The Etham dilemma is usually utterly ignored since all other proposed Red Sea crossings provides no block, stop, retrace and camp at the crossing point. The very idea that Israel was outside Egypt's control after crossing at the Bitter Lakes (the Hebrew's weekend fishing vacation spot while they lived in Goshen) or the major Egyptian seaport on the north shore of the Gulf of Suez (I would not rejoice after crossing, I would keep running) is unconscionable. In fact, the Straits of Tiran provide the only workable geography to solve the Etham dilemma. After crossing at Tiran into Saudi Arabia, they were truly "out of Egyptian control". 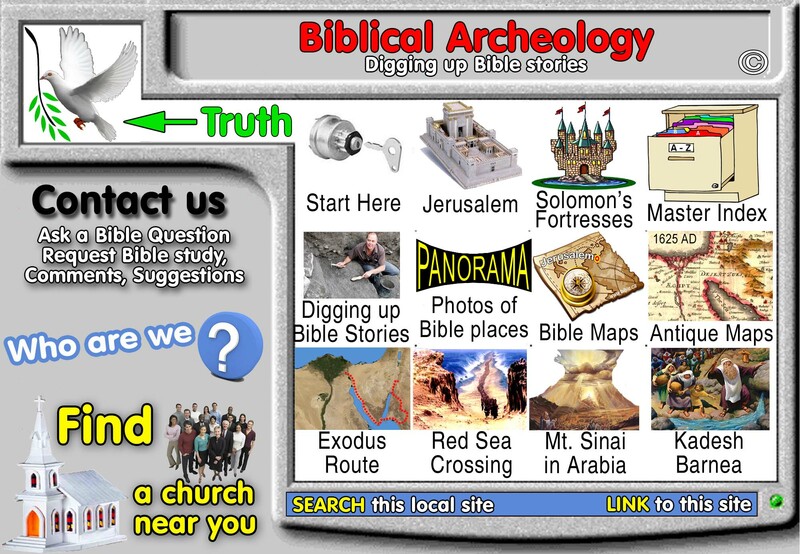 Only then did thy rejoice in the wilderness of Shur, the historic homeland of Ishmael and Jethro of Midian. 1. 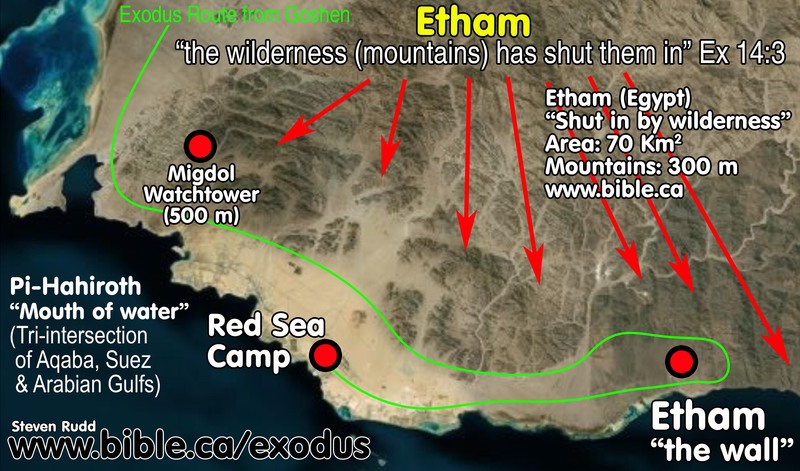 Immediately before the crossing of the Red Sea is "Etham, which is on the edge of the wilderness." Numbers 33:6. Traditional thinking interprets this as the starting edge of the wilderness on the west side of the Bitter Lakes before they entered what is traditionally called the Sinai Peninsula. 2. When you cross a wilderness there are always "two edges". The near edge at the start of the wilderness crossing and the far edge as you leave the wilderness. 3. 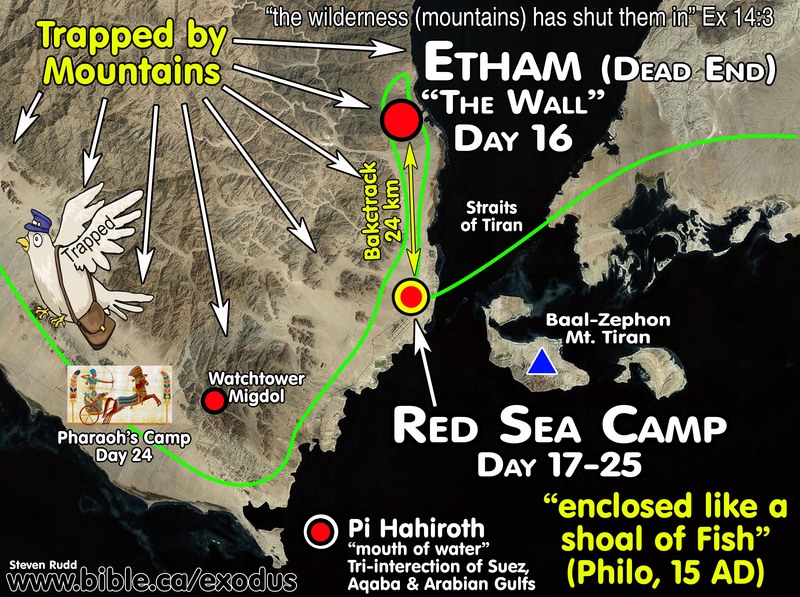 The correct interpretation is that Etham was on the far and outer edge of the wilderness after they had traveled through it to reach the Red sea. 1. Exodus 14:2 :"Tell the sons of Israel to turn back and camp before Pi-hahiroth, between Migdol and the sea; you shall camp in front of Baal-zephon, opposite it, by the sea. 2. Numbers 33:7: They journeyed from Etham and turned back to Pi-hahiroth, which faces Baal-zephon, and they camped before Migdol. 3. Pi-hahiroth means a "mouth of water" in Hebrew. Notice that "Pi-hahiroth faces Baal-zephon" in Num 33:7. If you look at the "mouth" it indeed faces Baal-zephon! The mountains are 300 meters high. Aerial view of the mountains that trapped Israel at Etham. Looking directly at the Mountain range from ground level. Etham has an area of 70 sq. km. Standing on the mountains that "shut them in". They turned back and camped under the nose of Pharaoh's watchmen in the Migdol who sent a message by pigeon in 5 hours back to Egypt. They waited 8 days for Pharaoh to arrive, then crossed the sea. 1. 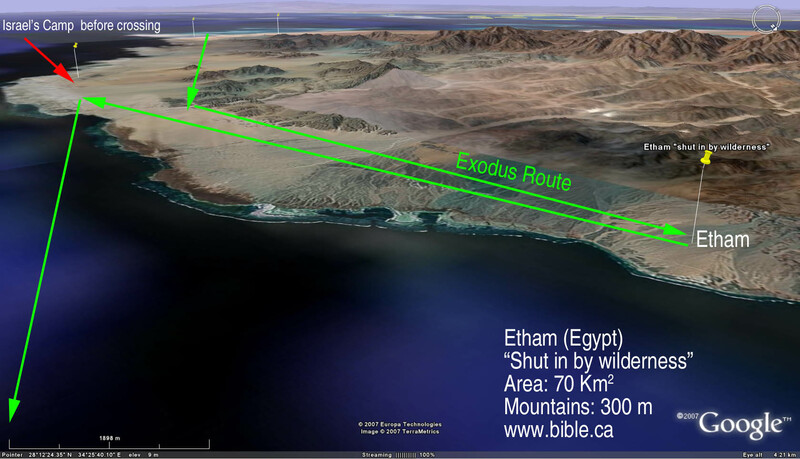 In the traditional exodus route, Etham would be somewhere past the actual Red Sea crossing point. It is important to remember that they went past the Migdol to Etham, then back tracked to camp at the Red Sea. For the Bitter lakes, such is impossible, for the Bitter lakes are so small, that anywhere past, would be on the other side of the Bitter lakes! 2. The Port of Suez crossing is also a disaster when you try to fit Etham into the route. If you go past the actual crossing point, you come to a huge open plain with no where to have the "wilderness shut them in".